Here’s a great make-ahead meal to feed a crowd these holidays. 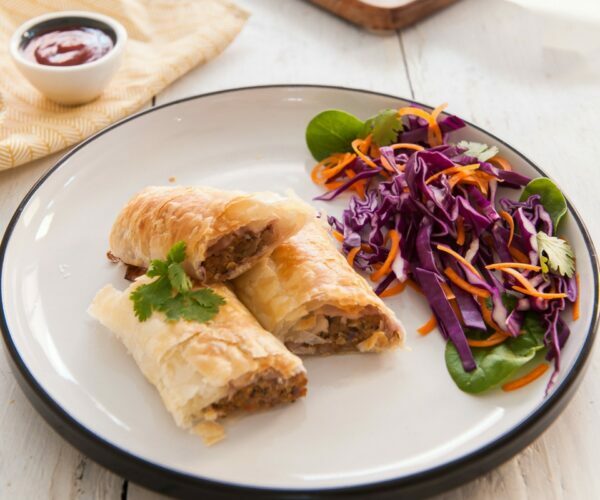 Packed with veggies, these sausage rolls are wrapped in ever popular puff pastry so they’re sure to be devoured by adults and kids alike. Traditional sausage rolls don’t tend to have many added vegetables. So you can feel proud knowing that you’re sneaking in veg that the kids may have normally missed out on. This recipe comes from our practical yet delicious Christmas and Entertaining Cookbook. Want more Christmas recipes? Check out The Healthy Mummy’s Christmas and Entertaining Cookbook for more ideas, as seen on Sunrise. Preheat oven to 180C and line two trays with baking paper. Defrost puff pastry on the bench, then cut each sheet in half lengthways. Squeeze out any excess liquid from the zucchini. Combine with pork, onion, carrot, tomato sauce and feta. Combine mixture well with your hands. Place the 6 puff pastry strips in front of you. Either use a piping bag or spoon the mince mix lengthways down one half (leaving at least a centimetre pastry border down the side) of each puff pastry strip in a sausage shape. Roll each pastry strip over tightly in to a roll and seal the edges with a little milk. Brush a small amount of milk over the top of the pastry rolls so they brown in the oven. Cut each pastry roll in half so you have 12 rolls in total. Place on prepared trays. Bake rolls in preheated oven for 20 minutes or until golden brown and cooked through. One sausage roll is 1 serve. Cool leftovers and store in an airtight container in the fridge or freeze to defrost and reheat as required. The Healthy Mummy Christmas and Entertaining Cookbook – as seen on SUNRISE! The Healthy Mummy’s 2017 Christmas and Entertaining Cookbook is NOW AVAILABLE! This cookbook contains over 150 recipes, is filled with healthy, easy-to-prepare recipes to get you through the party season and have you still feeling fabulous on the other side. Plus it is loaded with some awesome advice on what to do with all the left overs! Grab your copy of The Healthy Mummy Christmas & Entertaining Cookbook.